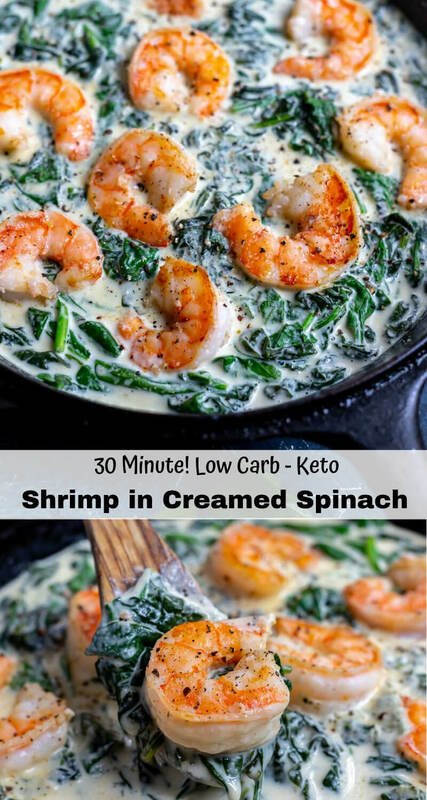 Try this Shrimp and Spinach Cream Sauce recipe for an easy low carb dinner. 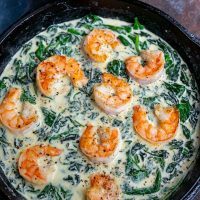 This 30 minute one-pan meal starts with shrimp and ends with creamed spinach with cream cheese sauce. 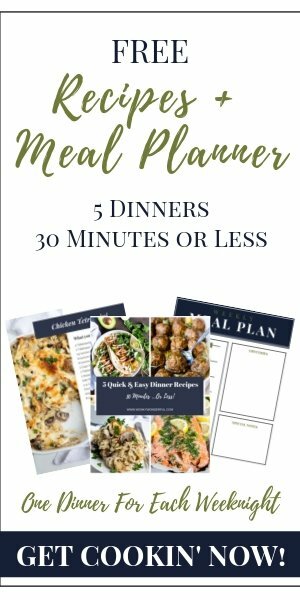 Eat this Keto friendly meal as is or serve over pasta. The best way to stick to a low carb diet while feeding a family that is not eating low carb is to make dinners like this one. 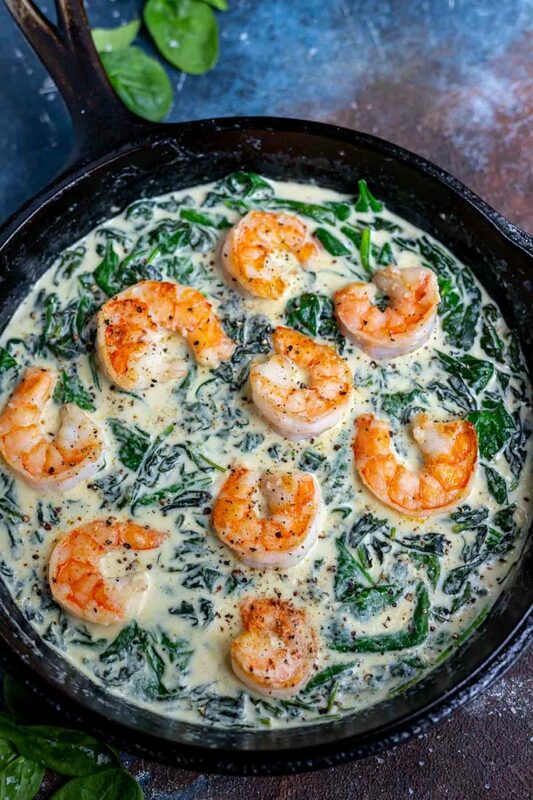 This Creamed Spinach and Shrimp can be eaten by itself for low carb – high fat. You can also serve this over pasta for those that are not eating low carb. 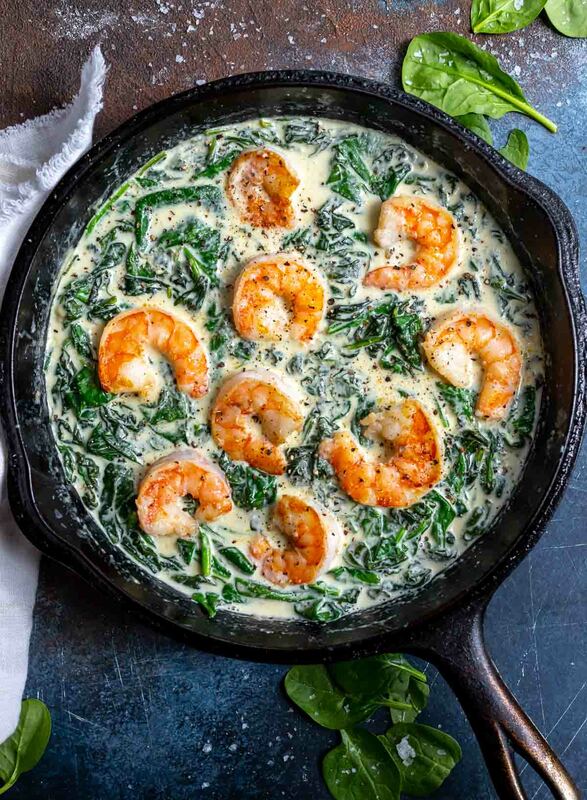 This dinner is a fun twist on creamed spinach. 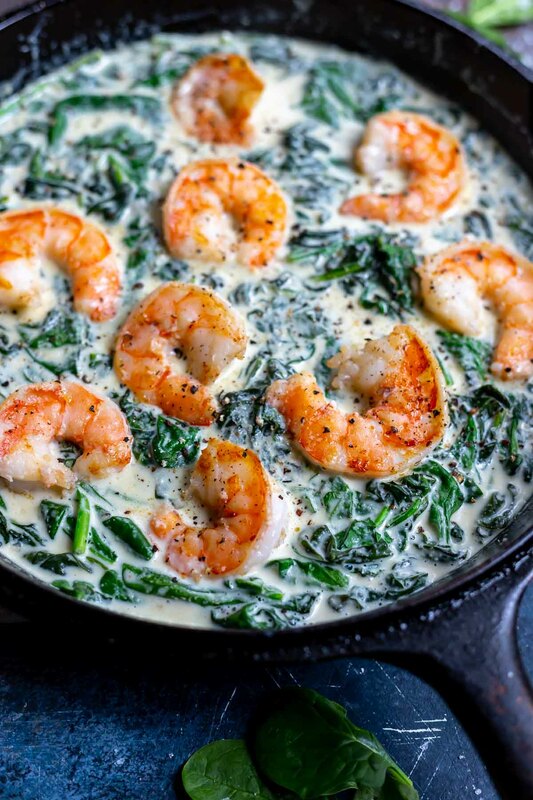 Add as much shrimp and spinach as you prefer. 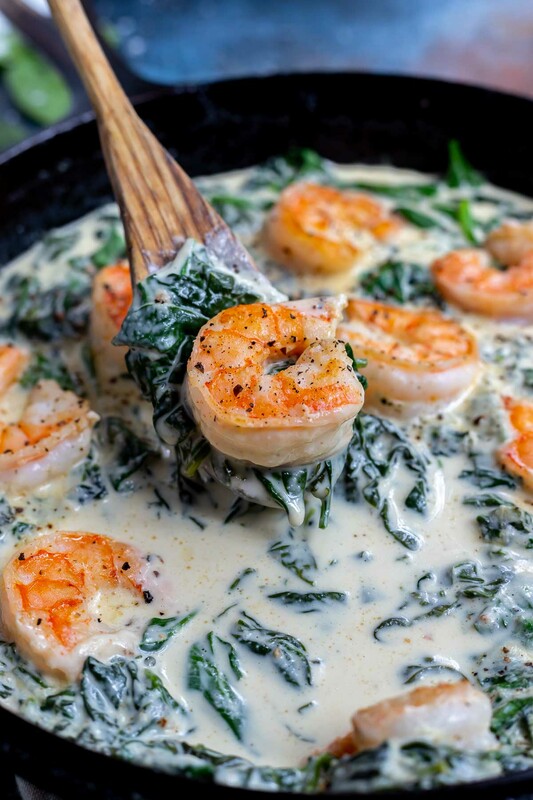 I usually double both because I like it full of spinach and shrimp with a light creamy sauce. Melt butter in cast iron pan over medium/high heat. Add shrimp to pan and cook 2-4 minutes (depending on size) until shrimp is just cooked through. Remove and set aside. Reduce heat to medium and add onion powder, garlic powder, heavy cream, cream cheese and water. Whisk until smooth and mixture begins to bubble. Add in spinach and cook while stirring 8-10 minutes, until spinach wilts. Salt and pepper to taste. Add shrimp back to pan and serve. LEMON BUTTER SEARED SCALLOPS: Juicy scallops in a rush buttery sauce all cooked in one pan in less than 30 minutes! LEMON BASIL SALMON: Oven baked salmon smothered in a buttery sauce with fresh basil for a pop of flavor. MUSHROOM SPNACH FRITATTA: Sometimes you want breakfast for dinner and this Frittata recipe for those nights. One pan and ready super fast! UNSTUFFED CABBAGE CASSEROLE: This is a family favorite and for good reason. This casserole is quick, simple, tasty and is great as leftovers.